This dish, pork chops with spicy salt could be a snack anytime or a main dish for dinner. If you bring this dish to a party for finger food (you have to cut into bite-size beforehand, of course), it won’t let anyone down. The red chilli and green spring onion (shallot) are very attractive to eyes and make people feel craving for more. 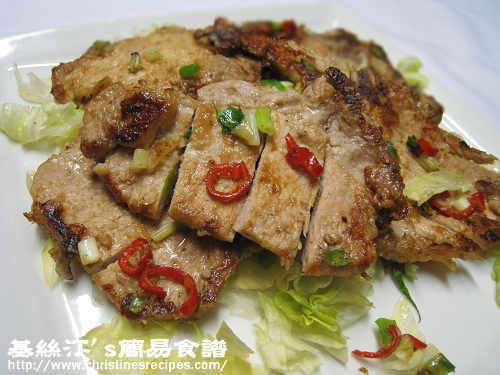 The pork meat is very tender, with aromatic flavours. This time I only cooked five spicy pork chops. It seemed not to be enough. I have to add three more next time then. Rinse pork chops and pat dry with paper towels. Tenderize with the back of a chopper. Marinate for 30 minutes. Heat 2 tablespoons of oil in a frying pan. Lightly coat both sides of pork chops with cornflour, removing excess flour. Fry both sides until brown and cooked. 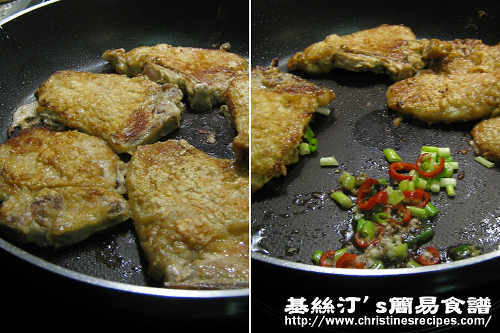 Push pork chops to the edges of frying pan. Add a bit oil in the center (see picture shown) and sauté spring onion, chilli and five-spice powder until aromatic. Sprinkle rice wine and pepper salt powder. Quickly stir and combine well with pork chops. Dish up and serve hot with lettuce or salad. Adding some freshly grated ginger sauce will help tenderize the pork chops. Hi! What exactly is pepper salt? Can I use equal amounts of salt and pepper instead? Thanks! The pepper salt powder is actually a kind of seasoning that contains salt, pepper, cinnamon and other spices. You can get it from Asian grocers. Or you can just use salt and pepper instead, and adjust the amount. Hi! How do you make the freshly grated ginger sauce? Thanks in advance! Simply peel the ginger and grate it with a grater, then squeeze out the juice.